Each of the HorseTravelBooks.com titles has a direct link to its own page on Barnes & Noble and Amazon.co.uk. Alternatively, all of our titles can be ordered from your local bookshop. The “soldier-author” was how Willard Glazier billed himself. A penniless schoolboy at the beginning of the American Civil War, Glazier enlisted in a cavalry unit of the Union Army of the Potomac and was soon captured by Confederate troops. After a daring escape, he was recaptured, only to escape a second time, before finally reaching the Union lines again. At the conclusion of the conflict Glazier wrote a book describing his wartime experiences. When every New York publisher rejected him, the young cavalryman self-published his work, hoping to make back his costs plus a hundred dollars profit. Instead, to his delight, the book took off like wildfire, selling 400,000 copies. With the $75,000 profit realized from his efforts, Glazier determined to ride “from Ocean to Ocean.” Leaving New York state in 1875 on his horse, Paul Revere, the former trooper set out to see the mighty Pacific, many miles and many unexpected adventures away. “Ocean to Ocean on Horseback” is Glazier at his best, complete with every sort of mounted adventure, and includes an account of how he was kidnapped by Arapahoe Indians. Amply illustrated with pen and ink drawings of the time, the book remains a timeless equestrian adventure classic. A prolific author, and a great friend of Mark Twain, Charles Warner made a witty and perceptive contribution to the world of nineteenth century American literature when he and Twain co-authored “The Gilded Age”, the book that gave the era its name. In 1887 Warner combined his urbane wit with a love of adventure travel when he penned “On Horseback in Virginia.” Always a keen observer, the roving author set out on horseback to investigate a great, rugged stretch of southern Appalachia. The extended equestrian journey took Warner from Virginia, through North Carolina, and into the remote hills of Tennessee. Additionally, the book contains a second narrative account of Warner’s equestrian adventures in the Old West. This time he saddled up and rode from El Paso, Texas to Mexico City, Mexico. Both tales comprise a book full of meaty descriptions told by one of America’s premier nineteenth century storytellers. Once they were famous from the Atlantic to the Pacific. If you had asked any American school children in 1911 who Bud and Temple Abernathy were, they would have given you a look of disbelief. “Everyone knows the Abernathy Boys,” they would have said. And they would have been correct, because the mounted adventures of the little Long Riders from Oklahoma Territory had taken the United States by storm. On their first equestrian journey in 1909 the tiny travelers, aged nine and five, encountered a host of Old West obstacles, including wolves and wild rivers, when they rode more than 1,000 miles from Oklahoma to Sante Fe and back – ALONE! The following year the intrepid brothers set their sights on New York City, which they reached after a month of hard riding. Along the way Orville Wright offered to take them up in his new-fangled airplane and President Taft gave them a warm welcome when they reached the White House. Kids envied them. Women adored them. Grown men pulled hair from their horses’ tails to keep as souvenirs. This public frenzy culminated when Bud and Temple rode their Oklahoma ponies alongside Teddy Roosevelt and the Rough Riders in a victory parade witnessed by more than a million cheering New Yorkers. Even though they were only six and ten years old, Temple and Bud Abernathy were a national sensation. In the summer of 1911, they did the impossible. They rode nearly 4,000 miles, from New York to San Francisco, in only sixty-two days. Once again, the Abernathy Boys had made a historic ride without any adult assistance and accomplished an equestrian feat which has never been equaled. Now this superbly-written version of their remarkable story, penned by a member of their family in 1910, has been reissued in conjunction with the creation of a life-sized statue being raised in honor of the world’s youngest equestrian travelers. “The Abernathy Boys were mounted heroes whose memory deserves to be cherished by a new generation of children and horse lovers,” said Basha O'Reilly, a Founder Member of The Guild and Fellow of the Royal Geographical Society, who rode from Russia to England. This new edition celebrates the equestrian legacy of Bud and Temple Abernathy. Go to Amazon.co.uk or Barnes & Noble. ISBN 1590480643 At first glance Theodore Winthrop didn’t look like a hardened equestrian adventurer when he set out to travel across Washington Territory in the early 1850s. The twenty-five-year-old was a recent graduate of Yale and a confirmed East Coast intellectual. Winthrop didn’t let his education handicap him however. Instead he set out to ride horses and canoes across some of the most remote portions of the early United States. The resultant book, “Saddle and Canoe,” is a vibrant picture of frontier life in the Pacific Northwest and covers the author’s travels along the Straits of Juan De Fuca, on Vancouver Island, across the Naches Pass, and on to The Dalles, in Oregon Territory. Throughout his journey Winthrop spent much of his time among both pioneers and Indians, whose picturesque descriptions are found within the pages of this historic travel account. Never one to hold back his opinions, the Yankee traveler thus regales the reader with personal observations and blunt honesty on a host of topics, people and places. Illustrated with drawings of the period, “Saddle and Canoe” also contains a vocabulary of the Chinook Indian language which Winthrop used during the course of this historic journey. A treasure to read, the book will be of interest to students of both the horse and history. The year 1939 was a bleak and gloomy time in England. Fire and darkness loomed on the horizon as war with Nazi Germany drew ever closer. In the midst of this national angst young Mary Bosanquet had a revelation. She would toss off college in London, board a steam-ship, voyage to Vancouver, Canada, then buy and ride a horse alone more than 2,500 miles to New York city. Simple enough! She could ride, had a grand total of eighty English pounds to fund the one-woman expedition, and figured horses would be cheap out in the Wild West of Canada. Besides, she reasoned, if the world really was going to self-destruct, she wanted a memorable adventure, “such as befell heroic voyagers”, before the global ship sank. If it was adventure the young English adventuress wanted, she got it! Bosanquet rode through the mighty Rockies, was wooed by love-struck cowboys, chased by a grizzly bear, feasted with lonely trappers, was adopted for the winter by a family of Irish farmers, and even suspected of being a Nazi spy, scouting out Canada in preparation for a German invasion. And through it all she had Jonty and Timothy, her whimsical and charming horses. If the three inseparable companions sought to put the news of Europe’s descent into the madness behind them, then their eighteen month journey through the silent mountains, dreamy forests, and mighty plains of pristine Canada provided the sanctuary they sought. Illustrated with photographs taken during her remarkable trip, Bosanquet’s story is as heart-warming today as the day it was written. A great many equestrian travelers could say they were inspired to take to the saddle because of the exploits of someone who rode before them. However John Beard is the only horseback traveler whose journey can be directly linked to the influence of the famous Buffalo Bill Cody. Beard determined as a child that he wanted to see the Wild West from the back of a horse after a visit to Cody’s legendary Wild West show . Yet it was to be more than sixty years after seeing the flamboyant American showman before Beard, and his wife Lulu, finally mounted their dreams. Setting off on a matched pair of horses, Black Diamond and Black Fairy, the Beards left to discover the long cherished equestrian quest of the author’s youth. Their mission in 1948 was to ride the length of the Old Oregon Trail. What followed was a 2,500 mile odyssey from Oregon to Missouri through a vast sea of weariness, thirst, hunger, hardship, and danger as the aged equestrians rode down the trail of their pioneer forefathers. Amply illustrated with photographs, “Saddles East” is more than a mere tale of adventure, it is the romantic story of two pilgrims of the sunrise riding back into the morning of their youth, hunting for America’s yesterday with everything they own on the backs of their faithful horses. 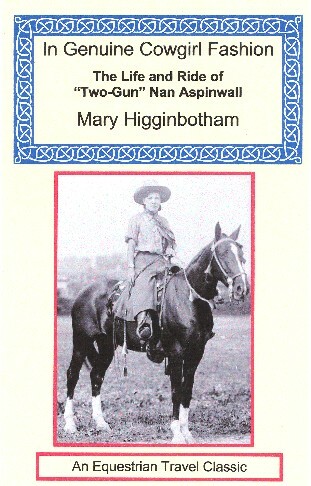 The Long Riders' Guild is proud to announce the publication of In Genuine Cowgirl Fashion, the life story of Two Gun Nan Aspinwall, the first woman to ride across the United States alone. Riding from San Francisco to New York City in 1910-11, Nan covered 4,496 miles during 180 days in the saddle. Please go to Barnes & Noble or Amazon.co.uk. The Old West was populated by a host of colourful characters including gunfighters, cowboys, buffalo hunters, sod busters, and at least one cavalry officer with the eye of an eagle and a penchant for fine writing. Colonel James Meline was an educated New York journalist, turned pony soldier, who had fought for the Union during the recent Civil War. With the country lulled into an uncomfortable peace, the fifty-four year old Meline decided to partake of one last mounted adventure before he hung up his spurs. Lucky for the history of equestrian travel that he did. The resultant book, “Two Thousand Miles on Horseback” is a beautifully written, eye witness account of a United States that is no more. Yet before that dire prediction became a reality, Meline participated in one of the greatest equestrian adventures of the time. He noted everything from the price of pistols to the practices of Pawnees. Border land barbarities too hideous “to write in English,” horses struck dead by lightning, forlorn graves, summer days so hot they drove men mad – Meline faithfully recorded the details of prairie life seen during his ride to Santa Fe. Once he reached fabled New Mexico the saddle-borne scribe fell in with Kit Carson. What followed was a three day marathon interview wherein the legendary frontiersman regaled the cavalry journalist with tales of fighting the Navajo, hunting gigantic grizzly bears, and eluding capture by Indians. Though the frontier they inhabited is a thing of the past, Meline and his cast of mounted characters still jump off the pages and dare you to ride down the road of adventure with them. Go to Barnes & Noble or Amazon.co.uk. With a superb new foreword by Brandon Schrand! The author, a sea captain by trade, spent his leisure hours on land riding his mare, Fanny. A self-confessed "septuagenarian,” Codman was never shy about sharing his horse-based opinions. Walking, Codman said, was a “solitary entertainment” and the bicycle he dismissed as being “unnatural.” Thus it was from the back of his horse that the old sea captain sailed over the land of his birth. This once-famous book, “Winter Sketches from the Saddle”, was first published in 1888. It recommends riding for your health and describes Codman’s many equestrian journeys through New England during the winter of 1887. “There is no greater pleasure than to find myself on a horse,” Codman wrote. The next best thing is to read his classic book!